I am sure ready for the weekend..
so did your team make it to the super bowl? Ours didn't, but we picked one to root for anyhow. 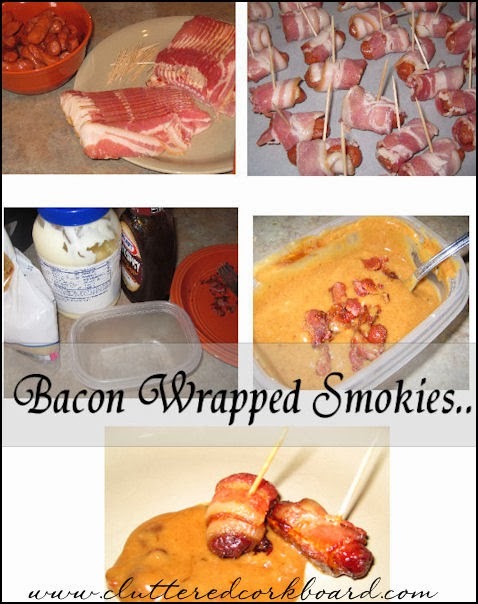 Here is a quick last minute food idea for the big game..
Wrap some lil smokies with bacon.. secure with toothpick, and bake until done. and then serve with your favorite sauce, or mix up your own.. So do you have a favorite football food? Watch football or don't watch football? Same type of uninteresting story with basketball but more recently. (because it was the college my son attends). And I have watched all of the games since that one. Yep, my DVR stays busy.